Neoclarityn tablets are a prescription hayfever medication which can be taken daily. Order Neoclarityn from Superdrug Online Doctor - our service is convenient and fast. To place your order, fill in our brief questionnaire about your health and symptoms and choose your preferred treatment. One of our doctors will review your order and approve an appropriate treatment. Please note, that Neoclarityn is not suitable for women who are pregnant or breastfeeding. Price includes prescription and delivery. The tablets contain an antihistamine and have been proven to relieve unpleasant hayfever symptoms caused by allergic reactions to pollen, pet hair or other allergens. Neoclarityn is a non-drowsy medication, which does not usually impair your ability to operate machinery or drive. 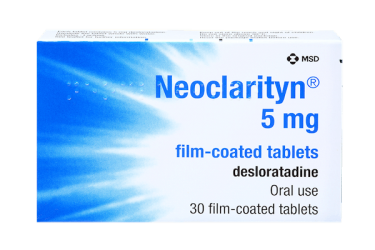 Neoclarityn tablets contain the antihistamine desloratadine. When you take an antihistamine, it acts on the process in your body which causes the allergic reaction. It blocks the chemical histamine which triggers the symptoms of allergic reactions. This provides relief from the symptoms of hayfever. Neoclarityn tablets are not only suitable for treating hayfever, but can also be taken to reduce symptoms of pet allergies and dust mite allergies. You can take one Neoclarityn tablet every day. Swallow the tablet whole with plenty of water. You can take Neoclarityn with or without food. If you forget to take a tablet, take the forgotten dose as soon as you remember, then resume your normal schedule. Do not take a double dose to make up for the tablet you forgot, as this increases your risk of side effects. Neoclarityn is not recommended for the use in pregnant or breastfeeding women. Neoclarityn can cause side effects in some patients. The most frequently reported side effects are fatigue, dry mouth and headache. In very rare cases, patients can experience severe side effects such as an irregular heartbeat, rash or seizures. These side effects are very rare and affect up to 1 in 10 000 people. Please read the Neoclarityn patient leaflet for a full list of all possible side effects. Do not take Neoclarityn if you are allergic to the antihistamines desloratadine and loratadine. Speak to a doctor before taking Neoclarityn if you suffer from a kidney problem. There are no known interactions between Neoclarityn and other medications. However, you need to tell the doctor if you have recently taken or if you are currently taking any other medication before beginning your treatment with Neoclarityn.